Legacy 2030 | Winston-Salem/Forsyth County Planning Board: What's Raleigh doing? The Growth Framework identified in the City of Raleigh’s 2030 Comprehensive Plan encourages infill and mixed-use development. Priority corridors are defined based on transportation function and relationship to adjacent land uses. The Growth Framework seeks to redirect a full 60% of future growth into the downtown area, seven city growth centers, 12 transit-oriented centers and over 40 mixed-use community centers. It is proposed that these centers be connected via a network of parkways, multimodal corridors and urban streets. The City of Raleigh intends to implement their vision for growth and connectivity through specific policy tools such as the Future Land Use Map and through amendments to the City's ordinances. Special overlay districts are being proposed to implement the preferred development pattern along selected segments of designated multimodal, urban, and parkway corridors. Recommendations in the Housing Element of Raleigh’s Plan include: creating new and affordable housing choices dispersed throughout the city, promoting home ownership, preserving existing affordable housing and providing opportunities for aging-in-place. The Plan also encourages mixed-use developments providing affordable and “workforce” housing, moving away from the monoculture of large-lot, single-family subdivisions to a more land-efficient model that accommodates a variety of housing styles. The Urban Design Element in Raleigh’s Plan provides recommendations to address “place-making”, creating a unique identity for the different areas of the city. This element of the Plan also recommends designing mixed-use developments to create active and vibrant spaces, changing the appearance and function of major corridors, creating inviting public spaces and the use of pedestrian-friendly design. Cities and neighborhoods throughout the United States are looking at ways to increase urban residential numbers and make better use of existing infrastructure through “gentle density”. 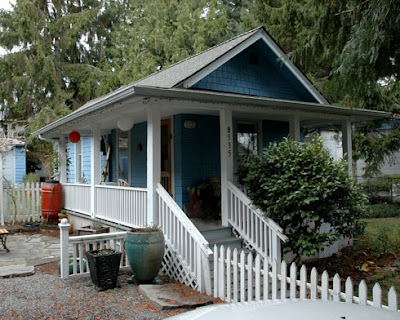 One method is to allow for detached accessory dwelling units in single-family areas. These units are sometimes referred to as granny flats, in-law apartments, guest houses or carriage houses. These units generally include a living room, sleeping area, kitchen and bathroom, and have a lockable entrance door.